The Wingspan rulebooks are available for download. There is also a full rules video by Watch It Played. If you have rule questions, please post them in the comments on this page, create a thread on BoardGameGeek, or ask them in the Wingspan Facebook group. The official Stonemaier Games response and solution to first-printing typos is posted here. Can you discard birds from your player mat? No, once you play a bird, it’s permanent. When I gain food from the birdfeeder, do I choose all of the dice at once, or one by one? Choose dice one at a time. This creates the potential for you to reroll in between dice selections. My bird card says ‘WHEN ACTIVATED: Gain 1 [food type] from the birdfeeder, if there is one.‘ There’s another bird card that says I can gain a specific food “if available.” Can I reroll if there’s only one type of die face in the feeder? Yes, regular reroll rules apply whenever you have the opportunity to gain food (see “Managing the birdfeeder”). When activating “migrating” birds that can move from one habitat to another, does the action token move with them? Can they move even if they’re the only bird in the original habitat? The action token stays with the original row, as that’s the action you chose for this turn. And yes, even if the bird is the only bird in the original row, they can fly over to another habitat (the point is just that they can’t move if there’s a bird card to their right). When a bird says that I can “repeat” another bird’s ability in the same habitat, how does that work? Basically, it means that you can re-activate any other “when activated” bird in that habitat. It doesn’t matter if you’ve already activated that bird or not this turn. Is the percentage on the Omnivore Expert bonus card correct? No, it should be 16%, not 10%. What does the Photographer score for 4-5 birds with colors in their names? This is a typo. Instead of 2-3, it should say 4-5. 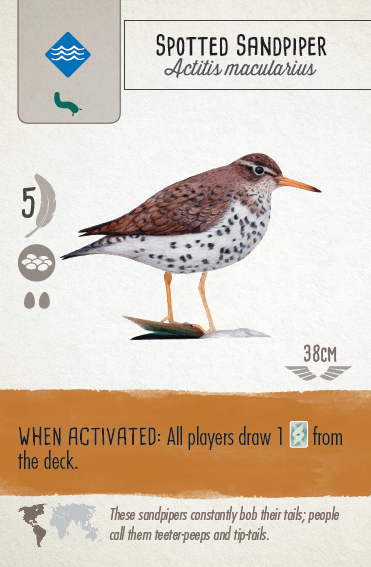 Should the Spotted Sandpiper be worth 5 points, not 4? Is there a list of all bonus cards in the base game? What are the card sizes and quantities? There are 212 cards in the game, each at the 57x87mm size. How do I know which printing I have? Why are so many of the birds in Wingspan from North America? 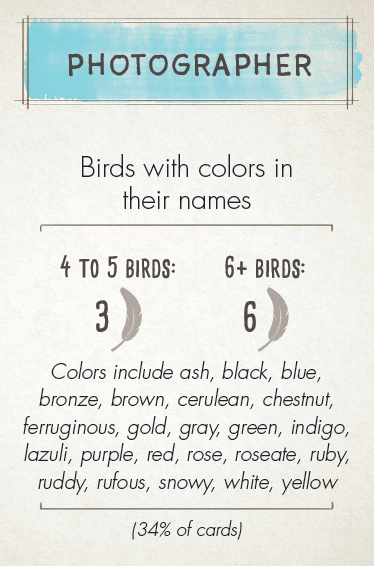 These are the birds the designer knows best, so she focused on them for the core game. However, the plan is for each expansion to focus on birds of a different continent. Does the insert fit sleeved cards? Does it have room for expansions? Yes, the insert fits sleeved cards (that’s a standard feature for all Game Trayz inserts). The tray will be full of sleeved bird cards, so expansion cards will need to be kept in plastic bags (they’ll still fit in the box). No, quite the opposite: Wingspan is heavily language dependent. Does Wingspan only include birds from North America? Most of the birds found in the core game are predominantly found in North America. However, each expansion will feature a different region: We’re hoping to explore Europe, Africa, Asia, South America, and Australia/NZ. Will the game be released in other languages? Yes! Our partners will announce their versions when they’re ready. Currently the game has been announced by Feuerland (German), Matagot (French), Maldito (Spanish), 999 Games (Dutch), and Delta Vision (Hungarian). Are there any unofficial Wingspan accessories or digital products? I love the idea of expansions with birds from different regions! What is the bird on the cover? Is it a real species or is it a made up bird? That’s a scissor-tailed flycatcher (a real bird). When reading through the rules I noticed a typo on the pink cards. It says BETWEEEN instead of BETWEEN. Yes, somehow all of our proofreaders (including me) missed that, but we caught it for the third printing. If you need some more help on proofreading, I have done it for several games so far. I’m not the best on syntax and more advance grammar and such (as English is not my first language, but I’m sure you have a lot of English speaking proofreader already) but I’m great at finding all the small mistakes and differences/inconsistencies between cards, rule book and other things that were not changed everywhere even when found (so this applies to rule book but also all the printed material). So if you want my help feel free to reach out. Can’t wait to get my copy! If you need some more help on proofreading, I have done it for several games so far. I’m not the best on syntax and advanced grammar and such (as English is not my first language, but I’m sure you have a lot of English speaking proofreader already) but I’m great at finding all the small mistakes and difference between cards, rule book and other things that were not changed everywhere even when found. I can proofread rule books, but also all the printed material. If you want my help, feel free to reach out. On another note, can’t wait for my copy this week! The question about rerolling dice says “My bird card says ‘WHEN ACTIVATED: Gain 1 [food type] from the birdfeeder, if there is one.‘ There’s another bird card that says I can gain a specific food “if available.” Can I reroll if there’s only one type of die face in the feeder? 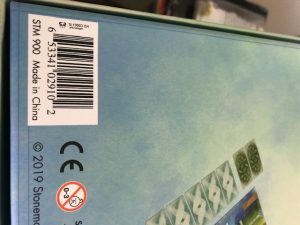 But this BGG post says for the indigo bunting, you cannot reroll due to the “if available” wording. Has this ruling changed? Situation: I want to take 3 food from the bird feeder and there are only two available and they are differing types. Can I take one and reroll all the dice (all the same rule) or do I have to take the two and the reroll? Yes, you gain food dice one at a time, creating the possibility for this to happen. Thanks for the prompt response. That’s what I did. Is the 3rd printing what is going out now? No, the first printing is going out now. Will it be possible in the future to get corrected versions of the cards which have bugs? Yes, I think we’ll supply the 2 cards with small, gameplay-impacting typos to the Geek Store. They’re good at shipping lots of little things. Will it be possible to get these 2 cards in the UK ? Yes, I will send a batch of them to Board Game Extras (UK) for anyone in the EU who wants them. you know, it’s nice to get replacements for the 2 cards with errors in the numbers, but the art mistake is just as important. just imagine if all the birds had exactly the same art. don’t you think it would affect gameplay? gameplay is not just rules (numbers) but also theme. the error in the art affects gameplay in the sense that it affects the theme. also, as a Champion, I would rather get a correct game later than an incorrect game sooner, and I feel penalized for actually being a Champion and getting a game with so many mistakes. I have noticed that you always listen to suggestions with an open mind, so I hope you will consider treating the error in the art of 1 card on par with the errors in the numbers of the other 2 cards, and find a way to get all 3 in the hands of Champions and other 1st edition buyers. Thanks for your feedback! I have read it with an open mind. I’m intrigued to know what the scores were like in play-testing. Now that people have received their games there seem to be some ridiculously high scores. Scores during playtesting were typically in the 70-90 range. I’m working on the assumption (hoping) that the first expansion will be UK/Europe. I just spent 10 mins on Facebook writing a post and adding a poll for people to suggest birds to you, unfortunately it wouldn’t post. Is there a way we can feed back to you what we’d like? Do you want that sort of input? You’re welcome to hope that. :) I saw the poll, and I’m sure Elizabeth will too. We see everything in the Facebook group. Thanks! It seems to have disappeared (Well I can’t see it). What is shown on the little map of the world on each bird card? The region this bird can be spotted? Or the breeding ground? I have the impression that there are a lot of birds that I have seen here in Europe but Europe is not marked on the map for these birds. It’s just where these birds typically live. It’s a minor nitpick, but why were 4 plastic trays included when there’s 5 kinds of food to separate? Are they not supposed to be used for the food tokens? Please see the chart on the side of the box. It shows food tokens going in 2 of the trays and eggs going in the other 2 trays. The egg colors are purely aesthetic–they should all be mixed together, not separated. We do sell plastic trays on our webstore. How about making a PDF available for use in printing paste ups for those who play with cards sleeved. First of all, sorry if this posted multiple times. The first time I tried to post, it led to a message the the site was down. I refreshed that page. But this BGG post stated the bunting would NOT be able to reroll due to the “if available” wording. Has this ruling changed? I consulted with Elizabeth, and she said that the normal dice-rerolling rules apply here. Re: Example on p8 – Shouldn’t it be Lay 2 eggs? It should! The player mat is correct. Sorry to revisit the typo problem again but when we get the British/European version can we have colour spelt properly! Just when I thought I’d got every rule worked out, along comes the Oologist. If I have one bird in each habitat with two eggs on each, is that two sets or does each set have to be achieved by being on different birds? John: The birds themselves don’t matter for the goal. In your example, it’s 2 sets because there are 2 eggs in each habitat. I’ve seen a couple of posts about running out of eggs. Tonight we had a four player game and we finished 15 eggs short. Will there be a way to buy sets of eggs? David: We don’t have a list posted yet. Could you double check? There should be 170. You were right, on a 4th count managed to separate 2 cards, how they survived together 3 games with heavy shuffling and then a couple of countings is a mystery :). BTW, thanks again for a great game! It’s possible I’ve missed it but did we ever get an official resolution to the question about the House Wren’s ability? All the other birds with a ‘play a second bird in your ‘x’ habitat can only live in one habitat and only have one habitat quoted but this bird lives in two habitats and has an either ‘x’ or ‘y’ choice. In the case of the House Wren can we play the second bird in a different habitat to the first or does it have to be the same habitat? Sorry, I didn’t realize there was a question about the House Wren. Because it’s referring to “a second bird,” it needs to go in the same habitat as the House Wren. We’ve just had a game where someone used the cartographer bonus card. At the end they had the Greater Prairie Chicken but it isn’t in the list for cartographer. Is there a reason Sandhill, Savannah and Mountain count as geographical terms and Prairie doesn’t or is this an oversight? Hi John: I’ll check with Elizabeth, but it may just be an oversight. Hi Jamey, we had this same cartographer end game scoring query come up in a game tonight, did Elizabeth provide clarification? Brian: Prairie should be included for the cartographer. Can you clarify I’ve got this right please? I had one ‘move to another habitat’ bird and one ‘repeat a brown power’ bird in the same habitat. In a turn, If the ‘move’ bird has already moved then presumably the ‘repeat’ bird can’t repeat because the other bird is no longer in that habitat, but if the ‘repeat’ bird is the first to use its action it can move to another habitat. You have that exactly correct, John! Regarding the birds that have the “when played you may play a second bird from your hand, pay its costs as normal” ability, when it says a second bird is that an implied limit on the number of birds i am able to chain with these cards? For example if I have 3 birds in hand and 2 of them have the above-mentioned ability, as long as I can pay the costs involved with playing them, am I able to play out my hand that turn? Joshua: Definitely, as long as you can play the food and egg costs, you can keep chaining them. 30 Automa games and I’ve encountered something new. The American Oystercatcher says ‘When played: draw cards equal to the number of players +1. Take 1, pass them on, each player selects one and passes them on. You keep the extra one. When playing against the Automa I have a few options. 2. Draw 3, Choose two myself and give Automa the last card face up or facedown dependant on fitting his criteria. 3. Draw 3, Choose two and give the Automa nothing. Thanks, Jamey. This was an edge case and we had a good discussion about it on BGG, if you’re interested. https://boardgamegeek.com/thread/2126943/automa-american-oystercatcher Following the spirit of the American Oystercatcher, not only do you gain 2 cards, but you get the added benefit of choosing from 3. Hi. Just a question about a card that says ‘when activated’ you take a certain piece of food from the feeder (when available) and you MAY keep it on the card. Now keeping it on the card will score you one point at the end. So the text suggests an option..is the other option keeping the food in order to buy future birds or is the text just misleading and there is no option. We are playing a dutch version of the game so it could be a translation problem. If it says that you “may” place the food on the card, you have the option of either keeping the food in your supply (to later spend) or to cache it on the bird card (for 1 VP at the end of the game). Hi Jamey: Quick question, has “Wingspan” been translated in Traditional Chinese? Or is it just in English currently? Thanks! 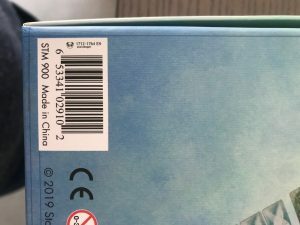 Wingspan is currently in about 10 languages, including Chinese (I think simplified Chinese, but I’m not sure–Surfin’ Meeple is the Chinese publisher). Hi Jamey, how does the game end scoring for birds work? Do you only count the points for birds placed on the mat or also points for birds which are still in your hand? I can’t find any hint on this in the rulebook. Overall I like the game idea very much, but the unprecise rulebook and a lot of typos and minor errors on both the cards and in the rulebook leave me with mixed feelings (I own the German translation by Feuerland?! If you need support with proofreading of the German translation, let me know). End-game scoring is detailed on page 5. You don’t get points for birds in hand. Hi Jeremy. Should “Pied” be counted as a color for the photographer card? Michael: No, it should not. Hi Jeremy, is it mandatory to activate birds from right to left, or I can choose the order? Right to left is mandatory. 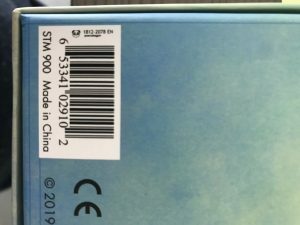 I noticed on BGG that people are mentioning they are receiving their replacement cards. Have they been shipped in Canada? Will they automatically come for those who ordered initially and/or champions? Just spoke with the good people at 401games and it is all taken care of! Would activating Anna’s Hummingbird and picking a mouse also trigger the bonus of the Loggerhead Shrike? We had a discussion about that in the last game. Player A played Anna’s Hummingbird in the woods. Player B had the Loggerhead Shrike. When Player A uses the “Gain Food” option and take a mouse Player B will get a mouse as well, no doubt. When Player A uses the “Gain Food” option and is taking a fish. Player B doesn’t get anything that’s clear as well. No due to the fact that Anna’s Hummingbird is in the woods it will be activated and each player will get another food token. If Player A takes a mouse now, will Player B get a mouse as well? or in other words is the activation considered to be still a “Gain Food” action? The activation is not considered to be the Gain Food action. So, activating a move bird to another habitat ability is not the Play Bird action, so you don’t have to pay the egg cost for moving to a new column? For “photographer”, can you count a bluebird? What about a bobwhite? I absolutely love the game. I live in Spain with my girlfriend and we love playing wingspan. The problem is that not many people in the family talk English (we have an English copy). Having the rules and powers reference in Spanish would help immensely. As I’ve seen Spanish versions on the shelf here, I was wondering when you will have the Spanish PDF’s up? Daniel: Have you checked with Maldito? The Spanish rules are theirs to share if they’d like to do so. I have a question about one of the Once Between turns card. I states “When another player’s (predator) succeeds, gain … What does ‘succeed mean? That’s referring to a predatory’s ability triggering for a positive result. Like, if a bird goes hunting for another bird and it fails (maybe the wingspan of the revealed bird is too big), that’s a failure.